So it is that time of year again for our annual shootout. This year we will be judging the top five Diddley Bows in the electric Diddley Bow category. 1.This is a stunning example with a flamed pine body, and a raised pickup section. The bridge saddle is an empty beer bottle. 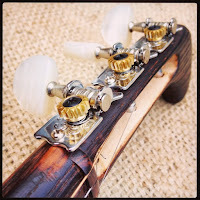 This is topped off with a genuine Condor pickup and one lone Grover tuner at the headstock. 2.The competition increases with this stunner from Lalloguitars. This instrument has a gorgeous mahogany body with a hand rubbed tru-oil finish. It is topped with a rosewood fretboard. 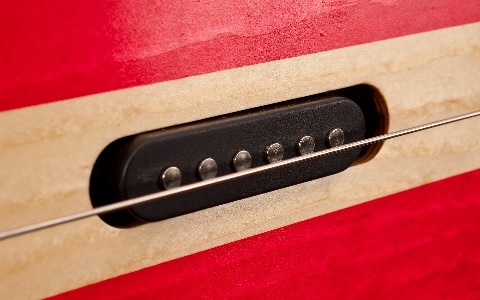 On board is one special design Italian handcrafted MAMA pickup. The string is secured at one end with a Kluson MG33N Grover button. (Wait a minute. Is it a Kluson or a Grover?) and at the other end it has through-the-body stringing. The nut is genuine bone. At the opposite end the flask saddle is secured between two maple strips. This baby has built in tone and volume controls. 3.Our next model comes courtesy of an Irish company called DaShtick.. 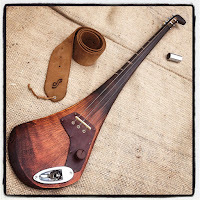 This is their three string Celtic model made from a hurley stick. 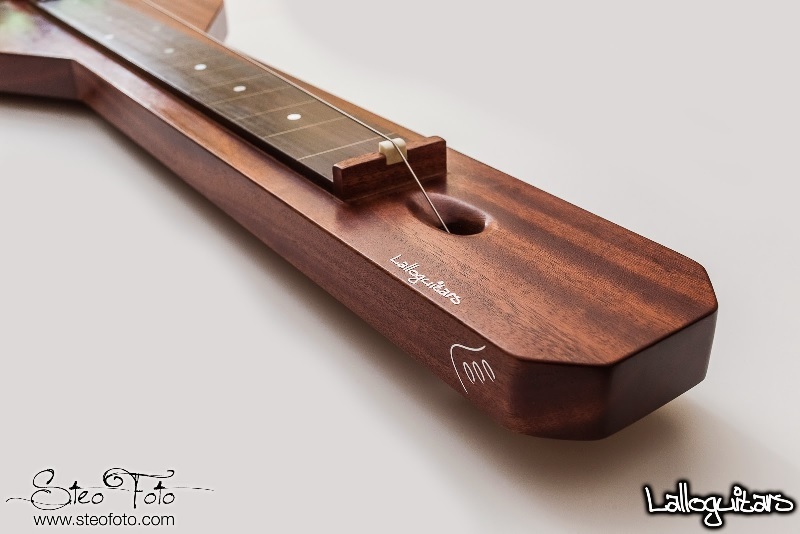 This handmade instrument utilizes ash, ebony, and mahogany. The bridge and saddle are genuine bone. 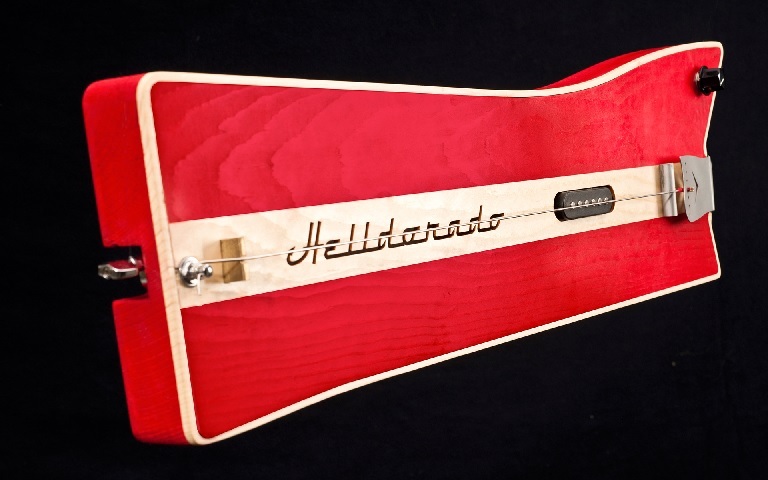 The saddle rests upon a guard of leather, that come with a single volume control for the built-in piezo pickup. A Fender stratocaster jack is at the end of the hand polished body. 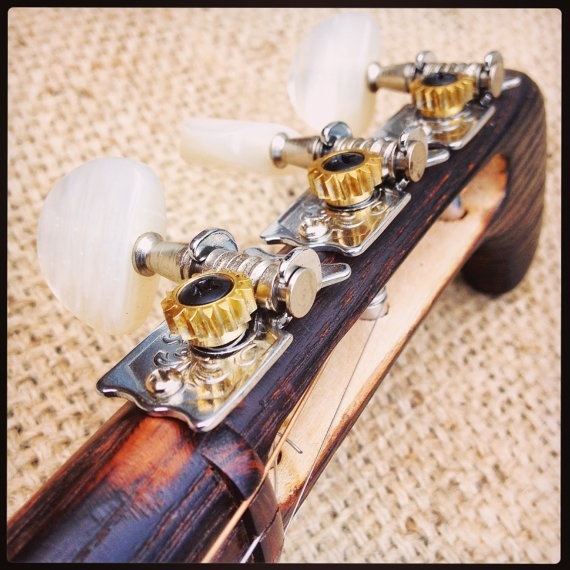 Three open Grover style tuners with pearl buttons adorn the offset headstock. It even comes with a leather strap. 4.C.B Gritty Crafter Supply brings us our forth nominee. 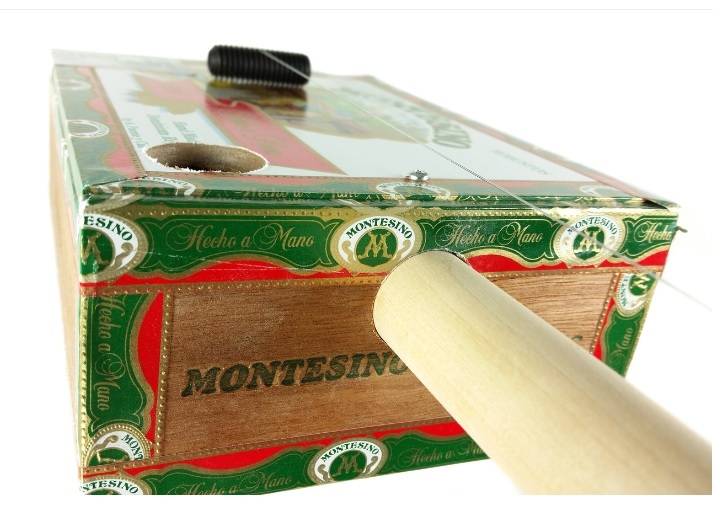 This do-it-yourself model includes all the parts you need including a Montesino cigar box body with a sound port, imported from the Dominican Republic. 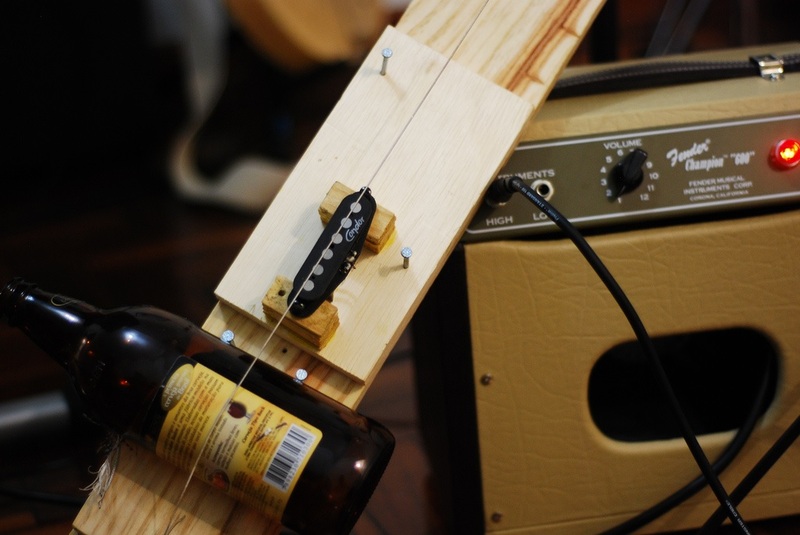 The wooden dowl is topped with 17 Home Depot supplied staples that are useful as frets. 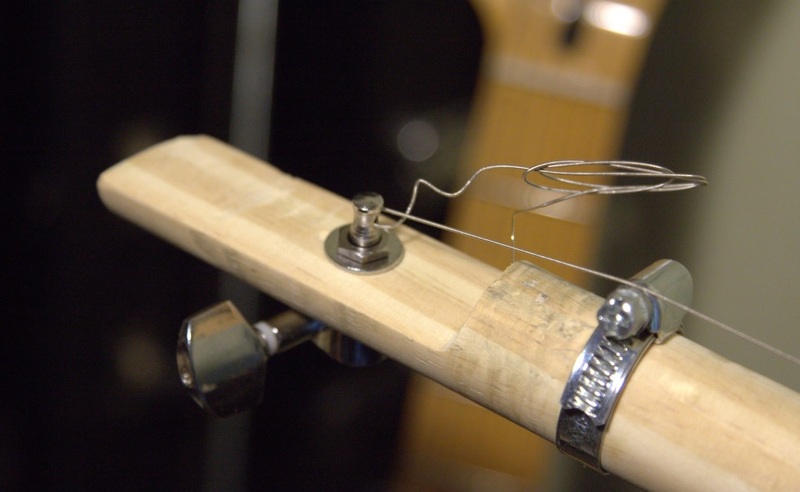 The string attaches to a single un-named tuning peg at one end of the dowl and attaches at the other. A piezo pickup is built into the body to give this bad boy it’s bang-your-head-against-the-wall, funky, get-down-with-your-bad-self, heavy metal, Saint Louie Blues character. 5.Our final entry comes is the Helldorado single coil pickup, single string model. This unusually shaped model is made of finest-kind pine wood with a nice red stain and the instruments logo running down the center of the body. The satin finish sets this instrument apart. 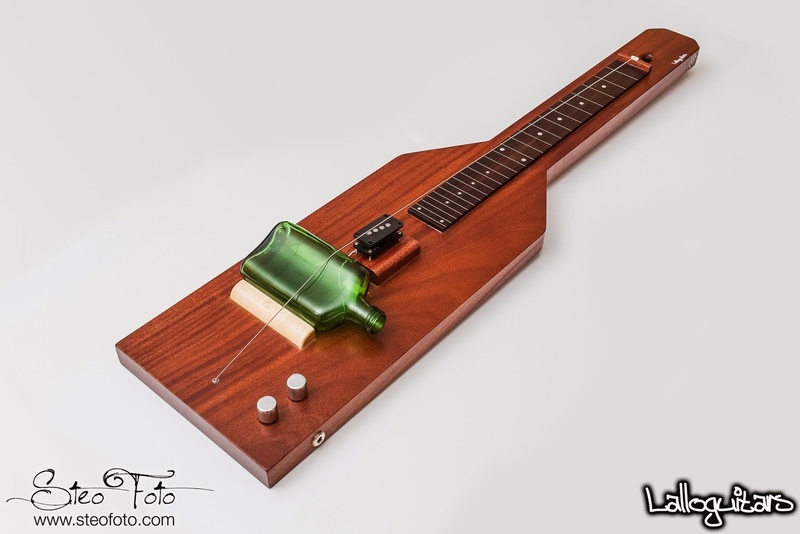 It comes with a single Grover style tuner at one end and a trapeze style guitar tailpiece at the opposite end. The bridge is a cast metal cylinder. The built in controls feature a single volume potentiometer. The judges have rendered their decision and it was a tough call between the Lalloguitars Didley Bow and the Irish DaShtick model. The 2017 winner is DaShtick. Who can argue with a hurley stick! By the way, did I mention this was April Fools Day? 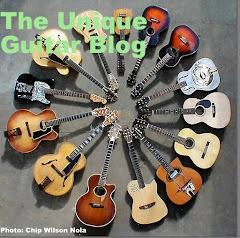 Enjoy yesterdays Guitar article and next week we will get back to profiling Unique Guitars.